First things first; what is actually true about a painting? Pared-down to essentials there are only four, real, components of a painting : area, edge, colour and texture. That is to say a painting is flat, usually rectangular in shape and delineated by a clear edge. Upon this habitat coloured marks, textured or uninflected, are made. And that is all. It is interesting to speculate as to why paintings are mostly rectangular - a tradition probably no older than the early 15C Flemish painters. Cave drawings are no particular shape and much early Italian painting is wall-based, following the internal shape of a building. Many of us live in rectangular rooms and a rectangular painting is presumably a reflection of its nature as a wall-mounted object - a removable commodity with, in the end, all the various implications for a transferable (and therefore commercial) artefact. So much is obvious. All the other truths about a painting are virtual, are read there by the eyes: whether the paint has been arranged to resemble something, any expressive property it may transmit, how it may be interpreted. At the end of the day a painting remains dried viscous stuff on a flat surface. It has taken several hundred years for this to be fully appreciated by practitioners (Cezanne: "I have discovered that painting is not sculpture") and it is arguable that Gauguin, incompletely realised as his work may be, is the 'father of modern art' - the first Post-Impressionist to paint flat: ["That's how I see it - flat " he harangues van Gogh during their catastrophic sojurn in Arles in the 1880s (in the film Lust for Life)]. Gauguin's flat, often uninflected, areas of colour were one of the starting points for Matisse, whence so much of what followed is derived. Composers and writers can move things around, rearrange, drop movements and chapters, contract and expand. A collagist sculptor can always add and remove. A painter a priori operates within the constraints as outlined. Perhaps only the writer of sonnets operates within narrower limits. Far from being limiting, however, paradoxically the constraints are liberating - but only when the implications have been taken on board by the practitioner. Painters have to discover these for themselves; they can't be told. Some of Peter Lanyon's late (early 1960s) paintings have lumps of wood (or cork?) stuck to them and it is arguable that while this may be a kind of desperate attempt to heighten expressivity, it actually merely subverts (rather than exploits) the intrinsic nature of a painting. It doesn't work. The American critic Clement Greenberg calls this type of procedure medium-scrambling. In this case the painting becomes literally three-dimensional and Greenberg diagnoses a failure of confidence/intelligence/pictorial imagination. Instantly the pictorial potentialities of the picture-plane, with all its availability for creating virtual space, are undermined by the superimposition of real space. Medium-scrambling can occur in any of the arts, such as with a piece of verse where the overall shape of the text on the page makes a visual image (didn't Ezra Pound do this?). It may also be worth making the (purist) point that much explicit narrative painting, such as Soviet Social Realism, is also a form of medium-scrambling. The paint is being used to tell a verbalisable story rather than the paint itself being allowed to tell its own story in visual terms. In such work pictorial considerations are displaced to a position secondary to narrative ones. A final point concerning the painting as a physical object is the instantaneity of its access. Nearly all other art-forms require some effort to be made before they can be savoured - get out a CD, a DVD, buy a ticket, go to the library, open a book. A painting is far more exposed - can be taken in as a totality in half a glance on a Monday morning. Evidence from many sources suggests that man is descended from arboreal ancestors who were selective feeders, (unlike, say, sheep which are ground-living and feed more unselectively). The first implies a high degree of visual (in fact stereoscopic) acuity concerning space ("miss that branch and you're dead"). The second implies a high level of cognition in distinguishing what is edible ("eat that berry at your own risk"). Our brains are hard-wired to 'make sense' of visual input. Both these a priori genetic residues have implications for how we look at paintings. "Space cannot be seen, only sensed" (Hofmann). The British painter Patrick Heron, also a very perceptive writer on art, pointed out that every movement in European painting is characterised by its way of creating pictorial space. (Heron's preoccupation with pictorial space led to his dismissal as The New Statesman’s art critic for his over-use of the word 'spatial', some fifty years ago). It is possible that every painter can be distinguished by the way spatial sensation is equated with a flat surface. If we accept Hofmann's dictum that space can't be seen, only felt, how is spatial sensation to be evoked from a two-dimensional habitat? Traditional perspectival drawing [eg vanishing points, or their converse with linear perspective radiating out from a near-to origin (Hockney sometimes does this)] works only if one accepts a tacit conspiracy between artist and observer that the painting itself is not really there. That it consists of a rectangular hole or window through which we are looking into a real space beyond. Van Dyck, Gainsborough, Constable and Monet all worked in this tradition (aerial perspective) without questioning its validity. This is not meant as a criticism; Constable's backgrounds are wonderfully firmly painted, but recall Braque on Monet: "He was a halfwit". It is clear, however, from even a cursory look at the work of some of the traditional classical painters that they were perfectly aware of the implications of the flatness of a painting and reconciled this with spatial sensation. Caravaggio and Claude Lorain come to mind. Indeed, they often exploit the flatness for heightened expressive effect. In one of Mantegna's otherwise flat paintings of St George and the Dragon the head of the slain dragon lifts right off the picture-plane to menace the viewer. Mantegna knew what he was doing. Many do not, irrespective of whatever the idiom may be. Personally I find almost all Lucian Freud's nudescapes spatially uncertain. This may be deliberate on his part, or may be a simple consequence of his work-practice which is to spend ages on a single component, say a foot, only subsequently joining everything up, but leaving the face till last. Sometimes the faces seem to float in front of the heads of which they are a part. En passant, when these two painters first came to notice they were hailed as 'gestural painters'. In fact all painting is gestural; something is used to make a mark on something else. There is a difference between gesture and gesticulation. The eye instinctively seeks out the space in a painting. It is obliged to. It attempts to occupy it and resolve the ambiguity consequent upon knowing that the painting is flat, but sensing it as spatial. Apart from linear perspective, traditionally a resolution has mostly been achieved in terms of figure-ground: something (the figure, ie object) registers as being in front of something else (the ground). At a purely formal level Francis Bacon is essentially a traditional figure-ground painter. His paintings contain the image, but are not, as rectangular totalities, images in themselves. In a public debate (in the late '50s?) someone interrupted the speaker, de Kooning, with a question: "And what about space?". de Kooning just held his arms out sideways and said "That's enough space for me", a response which begs the question. The comment above on Bacon applies equally well to Pollock. While he certainly brings his streaks and skeins in away from the edge (mostly leaving the corners rather unenergised), the eye still reads the paint as being in front of the unpaint which is read as recessional; Pollock is to some extent another figure-ground painter. In a recent radio-talk, the British painter Bridget Riley made the point that "if you are at all serious about what you are doing as a painter, you must, in the end, decide where your painting is - on the surface, in front of it, or behind it. And it cannot be in all three places at once". In other words, in her opinion, the way the picture-plane is used must be formally resolved. I agree. She also said: "It can't be done in one day". Most of the time I agree with this as well. For myself, the most interesting practitioners are those who fully resolve their work in terms of balancing tension across the entire surface of their rectangles with awareness of the a priori ambiguous nature of virtual depth: is that red in front of, or behind, or next to, that adjacent blue? We know it’s next to it really, but how do we read it? It is easy enough to make a flat pattern; what is difficult is to make it generate spatial sensation at the same time. The more sensitive a painter is to the picture-plane, the greater may be the spatial charge of the work. It is worth reading Heron's comments on Matisse's Red Studio in this context. Pictorial light works in the same way as pictorial space: the opposite of reality. In nature light shines unidirectionally on the scene and allows us to perceive its colour. The light in most Gainsboroughs is like this; you know where it is coming from, which bits are lit up and therefore coloured, and which bits are in shadow and register as non-chromatic. Early van Gogh is the same; think of The Potato Eaters. There are some artists (eg Irwin) who have found the light-emitting properties of coloured paint insufficient, have given up applying paint to a surface, and work wholly with light itself. Fair enough, but it is the challenge of resolving the multifarious imperatives when trying to make a painting (of which light is a component) which contributes to keeping painting going. Like space, weight cannot be seen, is only sensed. It is also relative. A mote in the summer air is a thousand-fold heavier than a blood corpuscle, but is lighter than a scrap of swansdown afloat under the willows. In a painting weight-sensation is also relative and is usually evoked by tonal contrast. Darker tones usually seem heavier than lighter ones, particularly so when the paint is arranged to look like something we already know to be heavy. It is instructive to look at a painting the wrong way up to realise how much we take weight-sensation for granted, especially if the work is non-referential. The result is unsettling and causes the painting to be read in a totally different way. It was Heron who pointed out that Braque’s Le Gueridon Rouge in the big 1946 show at the Tate had been hung upsidedown; a draped table top had been converted into to a massive lampshade. The hangers had missed the signature and presumably there was no helpful arrow verso. I have seen non-referential paintings with arrows all over the place on the back. One was even graced with the words 'preferred orientation' and an arrow. Something wrong there? Artists are sometimes their own worst enemies. Patrick Heron once wrote that non-figuration may be an ideal impossible of achievement. What he is acknowledging is our innate tendency to turn visual data into nameable experience. The debate figuration v non-figuration (all painting is abstract so I prefer not to use the word) is yesterday's argument. There is nothing wrong with working figuratively. What is worth pointing out, however, is that some of the recent figuration is regressive in its apparent unawareness of the huge advances in practice and aesthetic made last century in both Europe and the New World. Non-figuration grew naturally out of the great sweep of cultural evolution in picture-making which went before and which goes back several centuries. In one of his letters, for example, van Gogh predicts that the time would come when painters would dispense with 'subject matter' as such and would work purely with colour unencumbered by narrative association. Figurative work which ignores all this does not seem to be part of anything. A besetting sin, in any case, of much English painting, is its recourse to an illustrative linearity (eg Blake, Spencer, the Pre-Raphaelites). One sees this repeatedly in the work of young painters who seem to be devoid of any particular aesthetic. There is no real innovation, no real advance and no resonance. (Innovation implies its opposite - rejection. As Greenberg points out, innovation only works if what has been rejected has been mastered. Otherwise the innovative work will be infected with the same perceived failures as what is being rejected. Resonance implies that the work relates in some way to a previous body of work, is part of a process of tradition). J.S.Bach: "Music which is not at the service of something outside itself can never be beautiful, only pretty". Or more pertinently, the New York art writer Karen Wilkin: "The desperate manipulation of materials is not enough". All the preceding pages of comment have been essentially formalist in tone. They do not begin to address the problems of what a painting may be there for, or what it may be about (far more important, in fact, than what it may be of). What Wilkin is saying that whatever procedures may be adopted by the practitioner, there has to be an underlying raison d’etre, an 'agenda' of some sort. The practitioner must have some sort of idea as to what is being attempted, what is being 'looked for' (though even this seems a crudely over-articulated way of putting it). The real art, of course, is behind the surface manifestation which therefore has to be read accordingly. This is true whatever the modality. That history may subsequently come to quite different conclusions perhaps doesn't matter and should probably be encouraged; an artist of any stature can survive regular visits by historians. Van Dyck's sumptuaries are now sometimes regarded as little more than fashion-plate royalist-propoganda. This is not to say one shouldn't find them appealing at other levels. Cezanne said that he wanted "to do Poussin over again from nature". But is this the only thing he does? Those who came later said something else: Picasso on Cezanne: "It must so awful to have to paint an apple like that". Others have gone further, picking up on the unpopulated landscapes. the obsessiveness, the monumentally unfeminine women. The art-writer John Golding finds here 'a deep and unsatisfied need for male companionship'. And certainly Cezanne's paintings of his son and the allegorical groups of male bathers are somehow more human than those of his wife and the groups of lumpen female bathers, these late works being mostly characterised, at least to my eye, by acres of failed paint. It remains extraordinary that Cezanne was making these paintings at the same time as the late watercolour landscapes, translucent with interiorised, almost terminal, light. Maybe you really do have to be seriously screwed-up to make seriously great art. Hans Hofmann said "At the begining of a painting I absolutely want not to know what I am doing". Far from implying mindless activity, Hofmann is stating his conviction that he needed to trust the process of making the work, to get the surface of his mind out of the way, something that many painters who work by continuous improvisation will understand. Whilst the process may be goal-directed, the goal is unidentified until it is found, like searching the haystack for the proverbial needle when you don't know what a needle looks like. Continuous improvisation implies a process of constant decision-making, which is why such onerous demands are are made on its practitioners and why these are sometimes literally driven to the ends of themslves. Paint has a siren-ability to let itself be made to resemble something it isn't. Far from non-referential painting being easy, it is in fact much harder since nothing is borrowed from outside the painter - the whole process becomes one of re-creation in formal pictorial terms from the broth-like cauldron of life-experience. Humanity has surely been around long enough for every human feeling that is possible, by now to have been felt. All that is for ever new is the way the imagination may interpret a life-experience, something which is different for each of us. A corollary of all this, of course, is that if one is genuinely onself as a practitioner, one a priori avoids cliche. So the coloured marks 'stand in' for the painter's psyche at a particular point in time, being the selected operational responses to the painter's entire personal history at every level: what has been seen, remembered, felt, thought to be known - the whole alchemy. At this level, all art is conceptual. And you can't tell a lie with a painting. An artist of any conviction works from the interior necessity to do so. But however sincere this may be, sincerity alone is not enough (look at early van Gogh). It is no good setting out simply to 'express oneself'. It all has to be processed through whatever modus operandi is being grappled with. This implies an objectivisation of the engagement: Platonic distance. You can sense this in all great art: Bach's fugues, Beethoven's symphonies, Jane Austen's novels (what other writer would have stood so far off from her work as to evoke high comedy from the crisis on the Cobb in Persuasion? ), Shakespeare, Braque's still-lives, Cezanne's landscapes. Yet you cannot tell from their work directly what any of these people were actually like. There is no crude autobiography. But what does show is that these people really knew life. All their work enhances life through a kind of heart-mind expansion. Neither 'happy-holiday' stuff nor 'isn't life awful' bodice-ripping, but something which comprehends and subsumes the surface noise of life-experience into a purely aesthetic statement which still conveys an awareness of the kaleidoscopic flux of sentience. It was earlier pointed out that one of the problems with some recent figuration is its regressiveness in not having taken on board, absorbed, acted upon and taken further, the various achievements of New World abstract expressionism, particularly as contextualised by theorists such as Greenberg. A great deal of non-referential painting suffers likewise: billow-and-wobble. It is easy enough to cover quite a large area of canvas with coloured stuff in just a few minutes. With the work of a few painters, one is aware that that the surface has been smothered with business without a single colour-statement ever once being attached to the picture-plane. The result, however ardent and however fevered the intention, is uneasily flabby and finally depressing. A far cry from Mantegna's dragon. The billow-and-wobble effect arises from the uncertainty as to where anything is in such work. Insufficient tactility. Because there is so much unresolved accidental semi-illusionist space, the net effect is of no space-sensation at all, a kind of dimensionless horror vacui. All this may be a simple result of the artist having no very clear mind in the first instance. Certainly the effect is exacerbated by the tendency to evacuate everything into each work, presumably in the hope that if there is enough going on, something will have been achieved which means something. This leaves the artist no room to make the next work; all that happens is that you get a replay with each work coming out the same way. Over time, this type of 'homeless abstraction' decays into mannerism as does any habituated procedure. Call it what you will: 'Out to Lunch', 'Absent without Leave'; it is not enough to make paintings which come by the yard. Braque points out that the only thing that matters about a painting is what can't be put into words. By the same token, if one could actually 'explain' one's own work perfectly, there would be little point in making it in the first place. There is little point, also, in picking over all the ground up to the time I retired in 1989 from a full-time job in science to re-engage with painting. Almost all, but not quite all, the work made up to this time has been destroyed or dispersed. The time devoted to its making was in any case exceedingly discontinuous and the results were uneven, uncertain and unexploratory. Whilst recognising that one paints best what one knows, I am not sure why, in about 1990, I started painting non-referentially. I knew no other painters and had had only fitful exposure to the idiom. Thinking back, I can recall the self-inflicted groping. It was as if I was learning to drive again but with one foot hard down on the accelerator and the other failing to engage the clutch; the car never budged. All this work has been jettisoned. I made diabolical travesties of de Kooning's landscape early 1960s period, paintings 'sort of' based on crowded north London streets, even worse travesties of (the always admired) de Stael, and later Hofmann. I was working exclusively with oil paint. About this time, on account of my totally cavalier treatment of solvents, I became allergic to turpentine/white spirit. I still am. A move to acrylic paint in about '92 was yet another hurdle but is the medium I now work with most of the time. (Others are gouache, watercolour, oil pastel, conte crayon and b/w linocuts. I can still work with oil paint on a small scale). 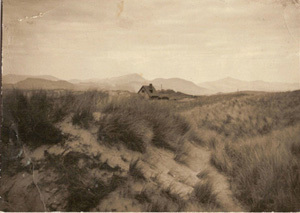 Felt memories of the Harlech environment will not go away (that is, of the maritime in particular), undoubtedly being due to having been brought up in it in a late-Edwardian menage in WW2 - in a very isolated house in the sandhills with four bedrooms, two parents, three live-in domestics, four siblings and just one communal room. Privacy was unknown. 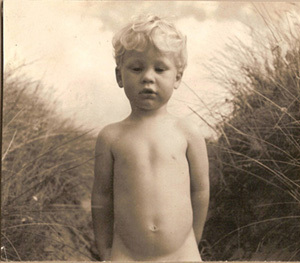 Naturally, as kids, we outed into the dunes and on to the beach. This is where it all comes from. Intellectually (and as an ex-ecologist), I cottoned-on pretty quickly to the fact that the Harlech morfa is the fastest-growing dune system in Europe, possibly in the world. The work from about 1993 is all about movement (another virtual truth) (with titles like Out There, Sand Movement, In Wild Terrain, From the West). A few people could sense the maritime in all this, something about that kind of outside space, that kind of outside light. But it was the memories of those early years in this place which were coming home, and which generated my preoccupation with pictorial space. Having been denied space in the domestic milieu, the landscape became an alter-home (as likewise the animal kingdom became an alter-family). There comes a point at which one realises that it is both too easy and simply not enough to make this kind of landscape reminiscence. All one really has to do is to make the painting, whatever that may be - and all that extra-pictorial agenda will take care of itself anyway. There also comes a point where all the hopeful slurp and so-called energy is not enough either, where something 'more or less' gives way to the old saw 'less is more', where in quite simple terms one looks for 'something beyond', quieter, emptier, but at the same time not in the least flaccid, indeed tougher. Put it all another way. Life is complicated enough already, so why add to that with yet more complexity? It is a far harder proposition to be simple without being plain dumb. People have talked about the 'courageous simplicity' and the 'musicality' of the work made in the last year or so; perhaps they are right. It's how a painting 'feels' which is important, much more so than how it baldly 'looks'. I feel myself to have no natural skills in all this and am certainly not a natural colourist. (But neither was the science an easy run). In the long term these deficiences may be useful in that one can turn them to advantage. The downside is that every single painting, however unstressful-looking the endpoint, goes through a nail-biting chaos in its development. I simply can not take short cuts. A mess seems to be necessary and each work has to be lived in until that happy God-given accident when the painting itself takes over and tells me what to do. And this cannot be arranged. People have sometimes likened my work to the late Milton Avery landscapes. I know what is meant, but the non-referential idiom I choose to work with makes simplicity even harder. ('Semplice' as a stage direction in music never works if interpreted literally.) The demands are multiple; the painting has to work in several ways simultaneously: as a formally complete-looking arrangement of coloured stuff on a surface, spatial sensation across the surface through the ambiguity of the cut of one colour-value into another, tension across the surface so the edges are gripped. A sense of scale. Something about daylight without recourse to atmospherics. Allusion without illusion, metaphor without narrative. Every square millimetre must contribute. If this is passion, it is without the purple. Like playing a game and solving a problem at the same time. It changes your life. I have deliberately made all of the above sound like a bland amble down Memory Lane. But I have to say that that the life-habit of the last fifteen years or so has been accompanied by a brackish deconstruction/reconstruction in personal terms I would not wish on anyone. The detail is unimportant but that it has happened at all has somehow meant that I have engaged with a self-generating process which uses all of the seven decades of me. A kind of homecoming to onself? An age thing? Is it about touch, that sensitive thing about the laden brush in the hand in contact with a surface? Something less aggressive, less fraught, more humanist, more reflective, more loving. I do not think about any of this when I'm actually working. The concerns then are just to get the ruddy thing right on its own terms. And of course, as one becomes increasingly single-minded about one activity, all the things that one might otherwise have spent time on, fade to unimportance, to irksomeness when their demands must be met. I am fortunate in having two studios so that arrival home from one means instant retreat to the other. I feel 'right' with myself in these spaces. The television has barely been turned on since Thatcher resigned (when it was on all day). For several decades we have been told that painting is dead, and it is worth considering why there should be this discrepancy between private practice and public perception. It is the received wisdom that we live in an age of over-weening trivialisation of belief, of the shortening of people's attention spans with a corresponding shift to the quick-fix of short-term sensationalism. Public perception of the political scene is likewise said to be one of spin and the sound-bite, as it is that educational dogma has succumbed to the utilitarian. It is not enough to acquiesce in all this. The populance at large has never been so affluent, well- (if over-) fed, nor educational opportunities so diverse, nor the public appetite for the blockbuster exhibitions so developed. Painting will continue to contribute to the psychic well-being of society provided it confines itself to, and develops, the things that only painting can do and nothing else can: the expressive arrangement of pigment on a surface unencumbered by overt narrative agendas. As does any art, painting requires a continuous process of its own reinvention. It is possible to argue, in fact, that painting has hardly begun, is still in its infancy. It is just that it may be too oblique in its impact for contemporary taste. It is dumb, static, uninteractive except through the eyes and elitist in requiring some degree of visual sensibility for its appreciation. (And in any case the Anglo-Saxon imagination is essentially literary, utilitarian. We don't do things as uselessly carefree as flags here with either much sense of joy or civic pride). The dumbing-down of painting, if this is what it is called, has coincided with the emergence of the more explictly conceptual and more easily accessible installation and performance arts. Whilst one may not have strong feelings either way about these developments, what is objectionable is that exhibition-spaces which were originally designed for paintings (or sculpture) are frequently hi-jacked for these arriviste concerns. Paintings require far more sensitive conditions of light and space for their best appreciation than does an assemblage of twitching video-screens and the like, where the interest is entirely in concept and very little in any imaginative or contemplative engagement they may elicit. An almost inevitable accompaniment to the dumbing-down of any art which makes some demands on the observer, is the emergence of the desperate and purely autobiographical. A recent, and much lauded, exhibition in Vancouver consisted of the domestic detritus collected over five years and packed into (presumably transparent) bags, originating from the life of just one so-called artist. A grant had been provided. No doubt a point was being made about consumerism, but beyond that....? A spot of paint is obviously no more virtuous than a plastic bag, but where is Yeats' shed in all this? Untransformed subject is not object. Tracey Emin's more blatant autobiographical self-promotion is equally dispiriting. Her face now adorns bottles of beer: "Tracey's Emin's Beck's Label". Perhaps she is feeling the pinch. Having been involved with the animal kingdom almost continuously for over forty years, I was almost daily familiar with pickled fish in display jars and somewhat unable to engage with Hirst's arrangements when they surfaced. Then came the shark and the sheep, both of which, encumbered with elaborate titles, seemed an expensive and impractical way of saying not a great deal. This new orthodoxy, descending as it does from 'the father of conceptual art', the late John Latham*, reeks of the academic. Sarah Kent's chatter about the 'pellucid gloom' of the shark was merely tiresome: all that pseudo-winsomeness. Hirst, in any case, has the declared intention of wanting to become a 'brand-name', so no doubt we can expect more along these lines. The surface of the age is not only trivial, it is decadent. Painters shrug their shoulders and plough their furrows. They paint for themselves anyway. There is a difference between a garden which has been nurtured organically through time and a rent-a-garden for a one-shot sensation. One can develop as a painter presumably only as fast as one does as a person. Likewise painting itself, which simple ego keeps alive below the surface, will resurface when society itself wearies of the instant kick of novelty for its own sake and rediscovers both belief and optimism. The current apathy is mainly due to a hiatus in intellectual stamina. * In the 1960s John Latham invited his students to chew up and regurge a dismembered copy of Greenberg's 'Art and Culture', bottling the spittings which are now in New York's MOMA (where they are rarely seen). Whilst a bit shocking at the time, this tiny spasm of protest now seems no more than an act of private infantilism, no more contributory than the Nazi book-burnings. Some years ago there was a pertinent press article concerning the titles of novels. The writer used Jane Austen's oeuvre as an example, claiming that titles should refer not to the surface phenomenon but to what the author considers the work to be about. In other words Pride and Prejudice, Sense and Sensibility and Persuasion are good titles but Mansfield Park and Emma are not. Probably with a painting which is non-specific, the title, if there is to be one at all, should follow suit. It seems no longer viable to call a work Untitled [though I recently found Untitled (self-portrait) which is risible]. Titles are not really important, but personally I try to find ones which indicate the direction of a thought process: Away, The Game is Over, The Loss, Beyond the View. These allude without defining and always follow, sometimes weeks later, but just occasionally arrive with the last brushstroke. Nice when that happens. Sometimes people inadvertently provide titles (A propos of which it seems likely that some of Pollock's work was titled by Greenberg or possibly dealers: Lavender Mist is a truly terrible title for that very large and beautiful work. Sounds like a female deodorant). (I happen rather to dislike titles which merely describe the painting, such as Red overlapping Blue, and also fatuously interchangeable ones). A figurative painting contains its own illusionist space, and such work can therefore can be close-hung, other things being equal. A non-referential painting presumably projects space-sensation beyond its four walls into the real space outside. It should therefore be allowed to occupy that space in real terms as a physical object without interference from other visual input. It needs more room. People tell me I have an eye for a hang (and have been involved with hanging some 40 shows in the last decade or so). It is a parallel business to making a painting, but easier. It is harder when extra-pictorial considerations have to be observed, such as in mixed shows when one is additionally obliged to be democratic. And finally, the Americans seem to be able to create better hangs than the Brits, eg the Tate Bonnard show a few years ago seemed spooky and glum over here but so much more better looking when I saw it in New York a few months later. And this wasn't just on account of the space being different. Over here the work had been hung chronologically; in New York it had been hung visually apart from one 'thematic' room which had all the self-portraits.